Although dermatologists are experts in managing scalp and hair diseases, the esthetic of some cosmetic therapies still remain elusive. Knowledge of hair cosmetics and esthetic procedures as well as of the hair shaft structure and physical behavior is indeed relevant in today's medical practice. Although hair cosmetics are widely available, the medical literature is rather scarce, and specialized literature is not readily accessible. The aim of this chapter is to allow a better understanding of the hair shaft structure and behavior, as well as information about the hair cosmetics. Knowing their mode of action, safetiness and ingredients will enable the physician to better assess different problems secondary to cosmetic treatments. Cosmetic hair care procedures are mostly used by African-descendent women, whose hair fragility has been related to be worsen by hair care practices. According to McMichael  hair fragility leading to breakage can occur due to genetic predisposition, weathering from various hair care practices. Hispanic patients also have curly or very curly hair that may clinically behave as sensitive as African hair when exposed to hair care procedures. Although scientific data is lacking to prove whether Hispanic hair is really as sensitive, it is common to see Hispanic women with chemically straightened hair, suffering from hair breakage and asking for the dermatologist help and advice to overcome the problem. Also, it is important to distinguish hair shed due to telogen effluvium from hair shed due to hair shaft breakage, which is not always clear from the patient point of view. Enhance shine, smoothness and manageability. Silicones are hybrid (inorganic-organic) inert, heat-resistant and rubber-like polymers derived from cristal quartz. Silica (silicon dioxide) common in sandstone, beach sand, and similar natural materials, is the initial material from which silicones are produced. In 2007 Keis et al. studied the effect of oil films on moisture vapor on human hair to analyze the capability of oils to reduce the moisture pick up. Although coconut oil penetrates, the fiber and mineral oil does not, there is the equivalent reduction on water sorption for both oils. Increasing the thickness of the oil layer on the fiber surface increased hair moisture regain. The oil that remains in the cuticle layer and not the oil that penetrates the cortex is the one responsible for the decrease in the water pick up. Afro-ethnic hair presents variation of diameter at several points along the thread (the diameter at twisting points is smaller than at other areas), less water content, and most importantly, an ellipsoid shape. Hair fibers present torsions at many regions along the thread, while Caucasian hair has a cylindrical cross-section. Also, hair body is maybe defined as the structural strength and resiliency of a hair mass, sensed by patients as having a soft and firm touch and full volume. Full volume is meaning a scalp full covered with terminal hair fibers that grow to the desired length without breaking. Disulfide bonds are cleaved using an alkaline reducing agent; then the hair is mechanically straightened using a comb during the reducing phase to restructure the position of disulfide bonds between new polypeptide keratins. They also react with peptide bonds, hydrolytically cleaving this linkage, producing acid and amine groups, and producing residues of aspartic and glutamic acids. The relaxers are applied on prewashed hair and after usage, must be rinsed off with running water. They provide the most permanent hair straightening but if applied with the wrong technique may cause scalp burns and hair breakage. The pH of alkaline straighteners varies from 12 to above 13. Hair is sensitive to pH value changes and alkaline solutions swell the fibers and open the cuticle scales. This can make the hair susceptible to friction, lowering its resistance and strength. Hair straightening needs to be repeated every 12 weeks or longer. The emphasis should be only on new growth hair since repeated treatments can lead to hair breakage, which usually occurs at the junction of the new growth and previously treated hair. Careful application to new growth only and previous conditioning of the hair can help prevent excessive breakage. In the work of Shetty et al., the most common adverse effects reported after chemical hair straightening were: Frizzy hair in 67%, dandruff in 61%, hair loss in 47%, thinning and weakening of hair in 40%, greying of hair 22%, and split ends in only 17%. Ammonium Thioglycolate is another "no-lye" relaxer that can cause extreme swelling of the fiber, but causes less supercontraction than the alkaline relaxers that work with lanthionization. It is a chemical reducing agent which selectively weakens the hair's cystine bonds instead of disrupting the entire protein. Afterward, the thioglycolate must be oxidized (neutralized) with a special solution of hydrogen peroxide. If a hot iron is applied during the process, the permanent straightening can be achieved. This is the basis of the process called "japonese hair straightening or thermal reconditioning." Thermal reconditioning involves "supercontraction" and transformation of alpha-helical keratin proteins in amorphous protein. No lanthionine is formed during this process, and 90% of the initial cystine content is retained with 10% additional cystine as cysteic acid. This means that the use of thioglycolate causes less protein loss than hydroxides. Soon, almost every salon in Brazil was performing the Brazilian Keratin Treatment ( BKT). Still, consumers complained of burning eyes, strong smell and burning mouth and nose. To avoid sensorial discomfort while appling the BKT, the ingredients used today are based not on formaldehyde or glutaraldehyde, but on formaldehyde-releasers such as methilene glycol or glyoxylic acid. Both substances are capable of releasing formaldehyde when heated during the blow-dry and hot iron application. Brazilian Keratin Treatment has increased popularity because the procedure is compatible with bleached hair and gives the hair a natural smooth, shiny look, impossible to acquire with the chemical relaxers. The mode of action of the formaldehyde is different from the others relaxers because formaldehyde or other aldehydes are not hair straightening products. The hair is remodeled straight because water breaks hydrogene bonds of the keratin molecule as happens in a regular blow-dry. The newly redesigned keratin is then kept in this shape because the formaldehyde crosslinks the keratin filaments in such a perfect alignment that the hair is now set straight and shines like no virgin straight hair is capable of. The light that strikes the hair reflects from the realigned keratin filaments and brings the effect of a brighter shiny hair. A study by Simpson and Crawshaw  which analyzed the reactivity of formaldehyde and wool keratin, found that formaldehyde forms cross-links with the keratin amino acids; arginine, lysine, tyrosine, histidine, and the amide derivatives of aspartate and glutamate. The most interesting characteristic of the aldehydes in the hair is that they are compatible to every other chemistry available to hair treatment, such as bleaching, permanent dyes and hair relaxer, lye or no lye. In Brazil, African and Hispanic hair is straightened first with chemical relaxers and afterwards treated with BKT to improve shine and softness. We may conclude that carbocisteine is not a hair straightening product by itself, and it is formulated combined with an aldehyde such as glyoxylic acid. Thermal treatments produce decomposition of tryptophan residues to kynurenine type oxidation products. The consequences are yellowing of white hair and darkening of bleached hair. After the thermal treatment with the addition of lipid products, hair may seem to be easier to comb. However, after shampooing and removing the lipids, hair dries out exposing the damage caused by excess of heat. There are many types of hair dyes classified according to the penetration of the dye to the surface or to deep parts of the hair shaft. In this chapter, we will approach the two most used types of hair dyes: Demi-permanent and permanent dyes. The main difference between the dyes are their capacity to reach the cortex and stay there in a permanent way or to not reach the cortex and stay shallow on the cuticle surface and be washable after about 10-15 shampoos. Those are the demi-permanent dyes. To overcome the cuticle and reach the cortex, the product must have an alkaline pH able to open the scales. Most of the times the permanent dyes use ammonia to increase the pH. Some products are referred to be ammonia-free, but instead, they carry ethanolamine with the purpose. Both substances remove the natural cuticle lipid, the 18-metil eicosanoic acid, which confers hidrofobicity to the fiber. The use of permanent dyes may cause cuticle damage by removing the 18-MEA and making the hair hidrophylic. Permanent hair colors are the most commonly used hair colors, because of their longevity, and ability to lighten the original darker color. These are also superior for gray or white cover. The pigmentation is permanent and the white hair that shows after 10-15 days after the application is not due to removal of the dye by shampoo but, instead, it is due to new hair growth. The permanent dyeing is an oxidation reaction that allows the pigments to get inside the cortex. The pigments are: Para-phenylenediamine, para-toluenediamine, and para-aminophenol, and para-aminophenol, known as the primary intermediaries) with hydrogen peroxide to liberate oxygen. And they also contain resorcinol, but this substance is gradually being removed from the ingredients in some markets, for safety reasons. Once inside the cortex, they combine with aniline dyes, to produce the required color molecules. The roots need to be touch-up after 15-30 days and the product must be applied only to the new growth. Chemical hair straighteners are highly alkaline. For this reason, changing the color of a chemically straightened hair, either with hydroxides or with thioglycolate, is a delicate procedure that may cause hair damage and breakage. Therefore, the demi-permanent hair dyes are indicated instead of the permanent ones. The lack of ammonia or ethanolamine is responsible for a more gentle action without opening the cuticle scales and respecting the fiber integrity. Is it, however indicated to wait 15 days after the straightening to dye the hair with demi-permanent dyes. Highlights or light shades are absolutely incompatible with chemical relaxers. Their combined use can lead to hair shaft breakage. Chemically treated hair is highly sensitive and prone to breakage. Although the dermatology practice involves the use of anti-dandruff and anti-psoriasis shampoos and lotions containing hair damaging ingredients, as well as minoxidil and other hair solutions, it is difficult to avoid hair weathering due to chemical procedures combined with hair medical treatments. The use of hair conditioners is indeed necessary to minimize friction and frizz caused by dermatological prescribed drugs. Choosing the right ingredients is absolutely related to achieve the patient's full compliance. Understanding the difference between the surfactants as well as the mode of action of conditioning agents, if on the cuticle or in the cortex, will help choose whether lubrication, strength, body mass, volume or sleekness is desired. Excess of residues is a matter of great interest due to frequent usage of leave-on products by African descendent or Hispanic descendent patients, especially with longer hair. Removing the residues without stripping the fiber is possible if the anti-residue shampoo (laureth ammonium-sulfate) is followed by the application of a thick moisturizing hair mask preferably containing hydrolyzed aminoacids, silicones and vegetable oils. Mineral oil is mostly substituted by film-forming silicones, but may still be used combined to other cationic ingredients. The anti-residue shampoo may be used each 10 shampoos, or even more frequently, depending on the need. Extremely highlighted hair is the most sensible to anti-residue formulations. In this type of hair, it may be used less frequently or not at all. Bolduc C, Shapiro J. Hair care products: Waving, straightening, conditioning, and coloring. Clin Dermatol 2001;19:431-6. McMichael AJ. Hair breakage in normal and weathered hair: Focus on the black patient. J Investig Dermatol Symp Proc 2007;12:6-9. Kamath YK, Weigmann HD. Fractography of human hair. J Appl Polym Sci 1982;27:2809-3833. Dawber R. Hair: Its structure and response to cosmetic preparations. Clin Dermatol 1996;14:105-12. Robbins CR. Chemical and Physical Behavior of Human Hair. 4 th ed. New York: Springer; 2013. Madnani N, Khan K. Hair cosmetics. Indian J Dermatol Venereol Leprol 2013;79:654-67.
de Sá Dias TC, Baby AR, Kaneko TM, Robles Velasco MV. Relaxing/straightening of Afro-ethnic hair: Historical overview. J Cosmet Dermatol 2007;6:2-5. Swift JA. The mechanics of fracture of human hair. Int J Cosmet Sci 1999;21:227-39. Syed AN. Ethnic hair care products. In: Johnson DH, editor. Hair and Hair Care. Vol. 17. New York: Marcel Dekker; 1997. p. 235-59. Shapiro J, Maddin S. Medicated shampoos. Clin Dermatol 1996;14:123-8. Deeksha, Malviya R, Sharma PK. Advancement in shampoo (a dermal care product): Preparation methods, patents and commercial utility. Recent Pat Inflamm Allergy Drug Discov 2014;8:48-58. Draelos ZD. Hair Care-an Illustrated Dermatologic Hand Book. 1 st ed. United Kingdom: Taylor and Francis; 2005. Draelos ZD. Essentials of Hair Care often Neglected: Hair Cleansing. Int J Trichology 2010;2:24-9. Trüeb RM. Shampoo. Ther Umsch 2002;59:256-61. Trüeb RM. 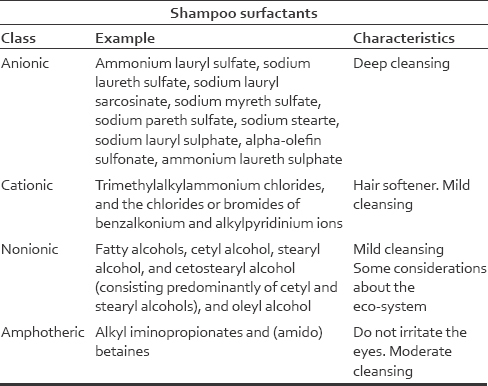 Shampoos: Composition and clinical applications. Hautarzt 1998;49:895-901. Draelos ZD. Shampoos, conditioners, and camouflage techniques. Dermatol Clin 2013;31:173-8. Abraham LS, Moreira AM, Moura LH, Dias MF. Hair care: A medical overview: Part 1. Surg Cosmet Dermatol 2009;1:130-6. Abraham LS, Moreira AM, Moura LH, Dias MF. Hair care: A medical overview: Part 2. Surg Cosmet Dermatol 2009;1:178-85. Hsiung DY. Hair straightening. In: De Navarre MG, editor. The Chemistry and Manufacture of Cosmetics. 2 nd ed., Vol. 4. Wheaton: Allured Publishing Corporation; 1993. p. 1155-65. O'Lenick T. Anionic/cationic complexes in hair care. J Cosmet Sci 2011;62:209-28. La Torre C, Bhushan B. Nanotribological effects of silicone type, silicone deposition level, and surfactant type on human hair using atomic force microscopy. J Cosmet Sci 2006;57:37-56. Nazir H, Lv P, Wang L, Lian G, Zhu S, Ma G. Uniform-sized silicone oil microemulsions: Preparation, investigation of stability and deposition on hair surface. J Colloid Interface Sci 2011;364:56-64. Nazir H, Wang L, Lian G, Zhu S, Zhang Y, Liu Y, et al. Multilayered silicone oil droplets of narrow size distribution: Preparation and improved deposition on hair. Colloids Surf B Biointerfaces 2012;100:42-9. Wilkinson JB, Moore RJ. Cosmetologia de Harry. Madrid, Spain: Diaz de Santos; 1990. p. 1039. Villa AL, Aragão MR, Dos Santos EP, Mazotto AM, Zingali RB, de Souza EP, et al. Feather keratin hydrolysates obtained from microbial keratinases: Effect on hair fiber. BMC Biotechnol 2013;13:15. Gode V, Bhalla N, Shirhatti V, Mhaskar S, Kamath Y. Quantitative measurement of the penetration of coconut oil into human hair using radiolabeled coconut oil. J Cosmet Sci 2012;63:27-31. Rele AS, Mohile RB. Effect of mineral oil, sunflower oil, and coconut oil on prevention of hair damage. J Cosmet Sci 2003;54:175-92. Keis K, Persaud D, Kamath YK, Rele AS. Investigation of penetration abilities of various oils into human hair fibers. J Cosmet Sci 2005;56:283-95. Fregonesi A, Scanavez C, Santos L, De Oliveira A, Roesler R, Escudeiro C, et al. Brazilian oils and butters: The effect of different fatty acid chain composition on human hair physiochemical properties. J Cosmet Sci 2009;60:273-80. Keis K, Huemmer CL, Kamath YK. Effect of oil films on moisture vapor absorption on human hair. J Cosmet Sci 2007;58:135-45. López LC, Cabrera-Vique C, Venegas C, García-Corzo L, Luna-Sánchez M, Acuña-Castroviejo D, et al. Argan oil-contained antioxidants for human mitochondria. Nat Prod Commun 2013;8:47-50. Harhar H, Gharby S, Kartah BE, El Monfalouti H, Charrouf Z, Guillaume D. Long argan fruit drying time is detrimental for argan oil quality. Nat Prod Commun 2010;5:1799-802. Aidoud A, Ammouche A, Garrido M, Rodriguez AB. Effect of lycopene-enriched olive and argan oils upon lipid serum parameters in Wistar rats. J Sci Food Agric 2014;94:2943-50. El Abbassi A, Khalid N, Zbakh H, Ahmad A. Physicochemical characteristics, nutritional properties, and health benefits of argan oil: A review. Crit Rev Food Sci Nutr 2014;54:1401-14. Robbins CR, Crawford RJ. Cuticle damage and the tensile properties of human hair. J Soc Cosmet Chem 1991;42:59-67. Wolfram LJ. Human hair: A unique physicochemical composite. J Am Acad Dermatol 2003;48:S106-14. Syed AN, Ayoub H, Kuhajda A, Ahmad K. African-American hair. Cosmet Toiletries 1995;110:39-48. Syed AN, Ayoub H, Kuhajda A. Recent advances in treating excessively curly hair. Cosmet Toiletries 1998;113:47-56. Syed AN, Naqvi AR. Comparing the irritation potential of lye and no-lye relaxers. Cosmet Toiletries 2000;115:47-52. Paola, M. U. V. R., Ribeiro M. E, Bonzanini VV, BedinV. Cabelos étnicos. Cosmet toilet 1999;11: 36-44. Borish E. Hair waving. In: Johnson DH, editor. Hair and Hair Care. Vol. 17. New York: Marcel Dekker; 1997. p. 187-9. Khumalo NP, Doe PT, Dawber RP, Ferguson DJ. What is normal black African hair? A light and scanning electron-microscopic study. J Am Acad Dermatol 2000;43:814-20. Khumalo NP, Gumedze F. African hair length in a school population: A clue to disease pathogenesis? J Cosmet Dermatol 2007;6:144-51. Sperling LC. Hair density in African Americans. Arch Dermatol 1999;135:656-8. Davis MG, Thomas JH, van de Velde S, Boissy Y, Dawson TL Jr, Iveson R, et al. A novel cosmetic approach to treat thinning hair. Br J Dermatol 2011;165 Suppl 3:24-30. Schueller R, Romanowski P. The science of reactive hair-care products. Cosmet Toiletries 1998;113:39-44. Khumalo NP, Dawber RP, Ferguson DJ. Apparent fragility of African hair is unrelated to the cystine-rich protein distribution: A cytochemical electron microscopic study. Exp Dermatol 2005;14:311-4. Dias TC. SÁ DIAS, T. C. Baby, André Rolim Kaneko, Telma Velasco, Maria Valeria Robles. Protective effect of conditioning agents on Afro ethnic hair chemically treated with thyoglicolate-based straightening emulsion. Journal of Cosmetic Dermatology 20078;7:126-128. Harris RT. Hair relaxing. Cosmet Toiletries 1979;94:51-6. Wong M, Wis-Surel G, Epps J. Mechanism of hair straightening. J Soc Cosmet Chem 1994;45:347-52. Kolar G, Miller A. Hair straighteners. In: Balsam MS, Sagarin E, editors. Cosmetics Science and Technology. 2 nd ed. New York: Interscience; 1972. p. 150-277. Obukowho P, Birman M. Hair straightening products: analyses of function, chemical structure and production. Cosmet Toiletries 1996;8:44-9. Shetty VH, Shetty NJ, Nair DG. Chemical hair relaxers have adverse effects a myth or reality. Int J Trichology 2013;5:26-8. Weathersby C, McMichael A. Brazilian keratin hair treatment: A review. J Cosmet Dermatol 2013;12:144-8. Galiotte MP, Kohler P, Mussi G, Gattás GJ. Assessment of occupational genotoxic risk among Brazilian hairdressers. Ann Occup Hyg 2008;52:645-51. Pierce JS, Abelmann A, Spicer LJ, Adams RE, Glynn ME, Neier K, et al. Characterization of formaldehyde exposure resulting from the use of four professional hair straightening products. J Occup Environ Hyg 2011;8:686-99. National Toxicology Program. Final report on carcinogens background document for formaldehyde. Rep Carcinog Backgr Doc 2010;i-512. ANVISA: Brazilian Health Survaillance Agency: Drug market regulation. Available from: http://www.anvisa.gov.br/cosmeticos/legis/mercosul.htm. [Last accessed on 2014 Jun 10]. Maneli MH, Smith P, Khumalo NP. Elevated formaldehyde concentration in "Brazilian keratin type" hair-straightening products: A cross-sectional study. J Am Acad Dermatol 2014;70:276-80. Simpson WS, Crawshaw G. Wool: Science and Technology. Cambridge: Woodhead Publishing; 2002. Available from: http://www.en.wikipedia.org/wiki/Glyoxylic_acid. [Last accessed on 2014 Sep 1]. Anderson SE, Ham JE, Munson AE. Irritancy and sensitization potential of glyoxylic acid. J Immunotoxicol 2008;5:93-8. Lee Y, Kim YD, Hyun HJ, Pi LQ, Jin X, Lee WS. Hair shaft damage from heat and drying time of hair dryer. Ann Dermatol 2011;23:455-62. Kim YD, Jeon SY, Ji JH, Lee WS. Development of a classification system for extrinsic hair damage: Standard grading of electron microscopic findings of damaged hairs. Am J Dermatopathol 2010;32:432-8. IARC (International Agency for Research on Cancer). Formaldehyde, 2-butoxyethanol and 1-tert-butoxypropan-2-ol. In: IARC Monographs on the Evaluation of Carcinogenic Risks to Humans. Vol. 88. Lyon: IARC; 2006. p. 1-478. Marsh GM, Morfeld P, Collins JJ, Symons JM. Issues of methods and interpretation in the National Cancer Institute formaldehyde cohort study. J Occup Med Toxicol 2014;9:22. Shrestha A, Ritz B, Wilhelm M, Qiu J, Cockburn M, Heck JE. Prenatal exposure to air toxics and risk of Wilms' tumor in 0- to 5-year-old children. J Occup Environ Med 2014;56:573-8. Couto AC, Ferreira JD, Rosa AC, Pombo-de-Oliveira MS, Koifman S, Brazilian Collaborative Study Group of Infant Acute Leukemia. Pregnancy, maternal exposure to hair dyes and hair straightening cosmetics, and early age leukemia. Chem Biol Interact 2013;205:46-52. Mazzei JL, Figueiredo EV, da Veiga LJ, Aiub CA, Guimarães PI, Felzenszwalb I. Mutagenic risks induced by homemade hair straightening creams with high formaldehyde content. J Appl Toxicol 2010;30:8-14. Shaham J, Bomstein Y, Gurvich R, Rashkovsky M, Kaufman Z. DNA-protein crosslinks and p53 protein expression in relation to occupational exposure to formaldehyde. Occup Environ Med 2003;60:403-9. Eastmond DA, Keshava N, Sonawane B. Lymphohematopoietic cancers induced by chemicals and other agents and their implications for risk evaluation: An overview. Mutat Res Rev Mutat Res 2014. Trüeb RM; Swiss Trichology Study Group. The value of hair cosmetics and pharmaceuticals. Dermatology 2001;202:275-82. Van Lerberghe L, Baeck M. A case of acute contact dermatitis induced by formaldehyde in hair-straightening products. Contact Dermatitis 2014;70:384-6.
de Groot AC. Side-effects of henna and semi-permanent 'black henna' tattoos: A full review. Contact Dermatitis 2013;69:1-25. Guerra-Tapia A, Gonzalez-Guerra E. Hair Cosmetics: Dyes. Actas Dermosifiliogr 2014. Gray J. The World of Hair Colour: A Scientific Companion. 1 st ed. Croatia: Thompson Learning; 2005. Turati F, Pelucchi C, Galeone C, Decarli A, La Vecchia C. Personal hair dye use and bladder cancer: A meta-analysis. Ann Epidemiol 2014;24:151-9. Hamann D, Yazar K, Hamann CR, Thyssen JP, Lidén C. p-Phenylenediamine and other allergens in hair dye products in the United States: A consumer exposure study. Contact Dermatitis 2014;70:213-8. Nohynek GJ, Antignac E, Re T, Toutain H. Safety assessment of personal care products/cosmetics and their ingredients. Toxicol Appl Pharmacol 2010;243:239-59.